Quality problems usually appear in the form of loss (defective items and their cost). It is extremely important to clarify the distribution pattern of the loss. Most of the loss will be due to a very small number of causes. Thus, if the causes of these vital few defects are identified, we can eliminate almost all the losses by concentrating on these particular causes, leaving aside the other trivial many defects for the time being. This is the basis of the Pareto Analysis method. A number of Lean techniques utilized in problem solving are really methods to visualize and control our work. In new product development quality is not always as well understood as we would like. Despite our best effort to understand and exceed our customer's expectations sometimes a long the way Murphy's Law comes into play. The adage is "anything that can go wrong, will go wrong." There is a technique that can help identify defects so they can be solved quickly called a scrap market. You have probably heard of a supermarket or even used one in your organization. As defined by LEI's Lean Lexicon a supermarket is a location where a predetermined standard inventory is kept to supply downstream processes. In this context a scrap market is a simple visual control where parts are identified as scrap or that could be suspect are categorized by the type of defect found. The following visual is an example of a scrap market for a new assembly cell. 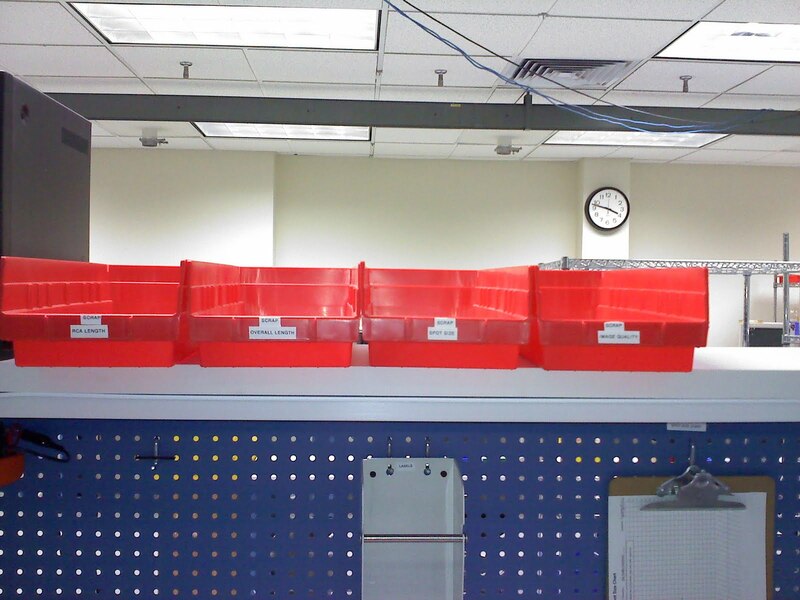 Several red bins (universal visual for defects) are labeled with defect types that can occur in the line. This provides real time feedback to those in the cell where the defects are occurring. Now the team can work to eliminate the root cause of the defects by starting with the highest impact defects. The bin with the largest quantity of defects has the highest contribution to poor quality. This is essentially a visual pareto chart where focusing on the vital few is possible. As you can imagine this visual technique has a number of advantages but where I think it has a large impact is launching new manufacturing processes. When you develop a new product and you transition from prototypes to a large scale production cell a number of new challenges can arise. The scrap market is a great way to capture those opportunities for improvement so they can be addressed promptly. Don't let quality problems affect your products. Your customers depend on it. Nothing concerns a customer more than defects on a new product they are trying to launch. Defects have a negative effect on market acceptance of new products. I really like this concept. 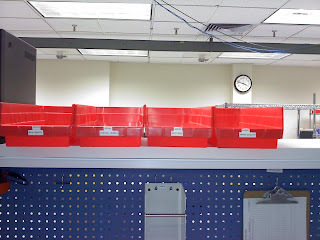 At a company in the past, we had the scrap pile. We made grilles for automobiles and our electroplating quality was getting out of control. We made a scrap pile right outside the offices so you couldn't leave the office with out seeing all the money we were throwing away. It was a great way to force questions to be asked and action to be taken. I have seen several versions since then and they all seem to work very well. Make the problem (scrap in this case) visible and painful in order to drive action. Great concept with the product development twist! I've seen people put them in vertical clear tubes instead of bins so the heights of the pareto bars could easily be seen as the scrap parts built up. Thanks Matt. I like the simplicity of this concept. Bryan, I really like your idea on the clear vertical tubes. I must try that in our piece/part assembly cells.